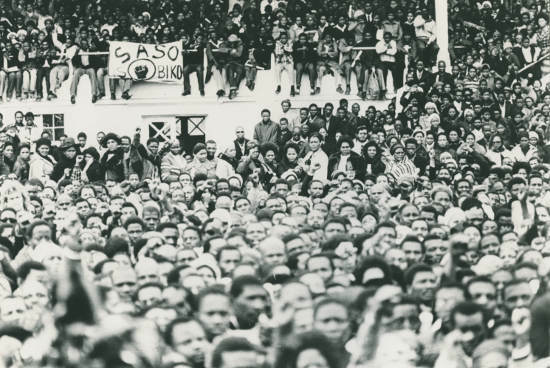 The crowd at Steve Biko's funeral, SAHA Original Photograph Collection. On 12 September 1977, the Black Consciousness leader Steve Biko died while in the custody of security police. The period leading up to his death, beginning with the June 1976 unrest, had seen some of the most turbulent events in South African history, the first signs that the apartheid regime would not be able to maintain its oppressive rule without massive resistance. The Soweto riots were followed by continuous unrest: students and workers in the townships of every province boycotted schools, universities and workplaces, and the regime was hard put to restore the apartheid order. By mid-1977, this had by and large been achieved, but elements of resistance and defiance continued to emerge. Biko’s death threatened to unleash a new wave of protests, and drew the attention of the world to the situation in South Africa. Biko’s funeral on 25 September was attended by some 15000 people, including the American ambassador and 11 other diplomats. A ban on open-air gatherings was extended to March 1978. The outrage of the US Congress at Biko’s death became evident when 128 of its members from both the Republican and Democratic parties sent a letter to the government urging that it allow an international team to go to South Africa to examine laws relating to political prisoners and detention. By 18 October, the Cabinet had decided to rack down on the most prominent Blak Consciousness-aligned organisations, and the next day, on 19 October, the government went ahead and banned 18 organisations (listed below). About 70 activists were arrested, including several members of the Soweto Committee of Ten, and many were banned, including Biko’s friend and supporter, editor of the Daily Despatch, Donald Woods. Two newspapers, The World and The Weekend World, were also closed down. International outrage now took a more serious turn. The US, the Netherlands, Great Britain, West Germany and Belgium all recalled their ambassadors for consultations. Instead of embarking on a process of reform, the apartheid government took steps to clamp down on resistance, and bolstered its means of keeping the Black population in check. One of the most significant of these was the power to curtail freedom of speech and the publication of material it deemed subversive. By 28 October, the government enforced the Newspaper and Imprint Registration Act no 19, a version of an earlier act that required that all newspapers be registered and conform to a strict code of conduct. Newspapers were also required to lodge a large amount of money (in the region of R40000) as a deposit before they could publish. The move was essentially a means to ensure that newspapers toed the line and regulated themselves, lest they be banned.